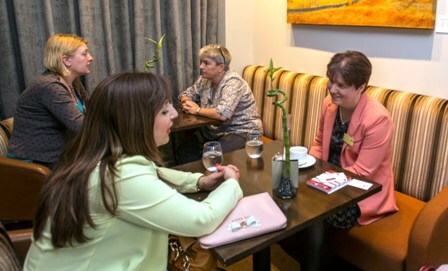 We have a new venue for our informal and friendly business networking events, which are focused on making and building relationships in the local area. The next Mid Month Meetup event, on 13th March 2018 between 12 and 2pm, will be at The Venue within Storthes Hall Park, with our usual speed networking sessions and a welcome talk from The Venue. 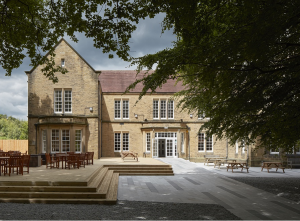 The Venue at Storthes Hall Park underwent a major refurbishment project 18 month back costing 3/4million pounds. The Venue dominates a large standalone building over two floors, comprising of a bar, cinema, eGaming room, large function area and two smaller activity areas with table tennis and pool available, and that’s only downstairs! Essentially a student café bar, the Venue provides areas upstairs where computers and meeting rooms can be used, for studies as well as being rented out to the business community. The Venue is also used by many dog walkers and people exploring the vast area covered within the park. There is plenty of parking and you feel like you are in the middle of nowhere, however you are no more than 15 minutes out of town or from the other far reaching areas of the HD8 postcode. It is one of the many hidden jewels of the area which the HD8 Network strive to reveal. The buildings that greet you as you drive into the park, before you reach the Venue, is the accommodation for the Huddersfield University students and along a long roadway opposite the Venue, lives Shelley Football fields and Stafflex Arena. The Venue has also been used by the team at AD:VENTURE to deliver some of their business growth workshop sessions. Businesses will be paired off for the Speed Networking sessions, each having 5-6 minutes to introduce their business and let others know about their advancements and offers. This structured approach brings energy to the room and helps you identify quickly whether you want to follow up the conversation at another time. Everyone gets to have conversations with at least half of the people in the room – on occasion this can go into extra time, but the organiser refers to it as ‘Carnage’. Pairs are managed by a timekeeper ringing a bell to indicate the halfway point – where most people swap talkers – and a whistle signally for the ‘mover’ to rotate to their next candidate. This type of networking gets you engaged without having to stand up and perfect, or not, your public speaking skills. The HD8 Network also bring interesting and useful speakers to the Mid Month Meetup networking event, which also allows members the opportunity to provide a ten-minute overview of their business. This month it seems fitting that the spotlight will be on Storthes Hall Park and the Venue. “There are many people who live in the area and commute far for work, and many that live far away however commute here for work. One of the visions for the HD8 Network is to challenge that balance and reduce travel time and congestion, freeing up more time for rest and play, inviting more visitors to the area and supporting the wonderful leisure, retail and food organisations here”. The HD8 Network online events calendar and social media communities, as well as the e-newsletter, news blogs and business directory make this all possible. For most, it is free at the point of service, however for businesses wanting to reach more people and develop their profile there is a small charge to help cover running costs and develop the platform into something that delivers the service that makes your life more fun, easier and local.